My look at the golf year that was continues with a look at another fantastic trio of par-3s. 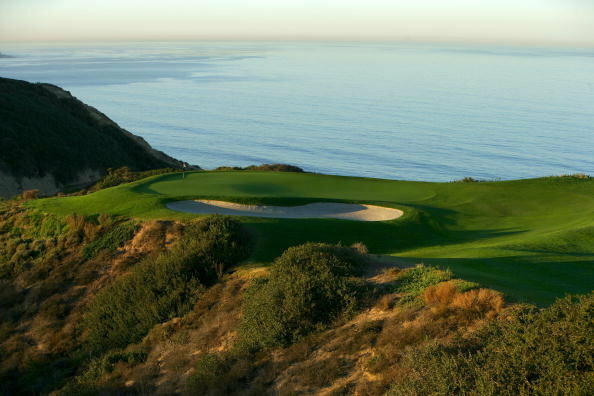 It says it all that when you think of Torrey Pines, this is probably the hole you picture – unless it’s No. 6 on the North Course, which is its equally incredible ocean-view par-3 counterpart. Both holes give you that spine-tingling dramatic elevation change. Both holes are played to the stunning Pacific Ocean backdrop. 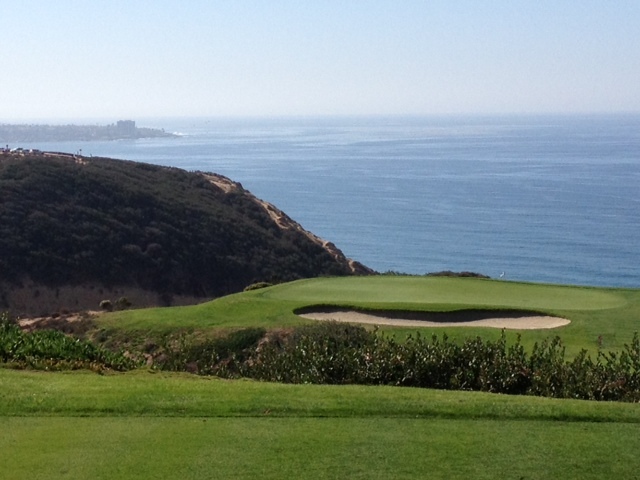 Both holes give you that mesmerizing glimpse of La Jolla in the distance. Both holes also play slow because, well, you just have to take a picture. Have to. No. 3 gets the nod for the blog this year because we’re not debating which is the better hole. Rather, it’s which one was more memorable to me, and for that I have two moments. Anyway, there was no such lack of celebration when I dropped my tee shot there to 10 feet in November. An easy 9-iron just cleared the lip of that menacing bunker fronting the green and settled in gently below the hole – a perfect birdie opportunity. My only regret is that my putt stayed a hair outside. If I could use one retro mulligan for my season, I’d burn it there. If you want a less adventurous route to par, there’s a significant bail-out area to the right. And left or long is OB. If you don’t club the tee shot right, it can ugly, which would be a shame on such a gorgeous golf hole. Club down one, trust your swing and you could experience that magical combination of a great golf shot meeting a truly great golf hole. I gave this hole its own post during Tiger’s World Challenge, so you can look that up if you want to read even more about this one, but you’ll have to look for No. 15 because that’s what it played as during the tournament. I won’t repeat all of that post here, but I will add a little post-script to that post from the World Challenge. You can may recall that this hole took a bite out of the pros on Saturday of the World Challenge. Of the 17 players in the field, 11 found the sizeable water hazard in front of the green that day. It turned into one of those golf TV train wrecks you simply can’t take you eyes off of. Having been there, I have to say that I never saw that coming, but also the wind didn’t blow there the day we played and the commentators said gusts rushing down the mountain baffled the pros all day. I believe ball No. 11 going in the drink was followed by one of those “boy, that wind really has these guys fooled today” kind of comments from the booth. Even without the wind, birdie was hard to come by. This green is one of the slickest at Sherwood. I knocked a 7-iron into the back of the green and then watched my putt turn into a freight train on the down slope. Bye, bye, birdie. Hello, three-putt bogey. I didn’t feel so bad when I saw that happen to a couple pros. The day I played, we were in a scramble format and I played his hole on the latter half of the round. After being stunned and amazed over and over, seeing No. 6 for the first time still took my breath away. 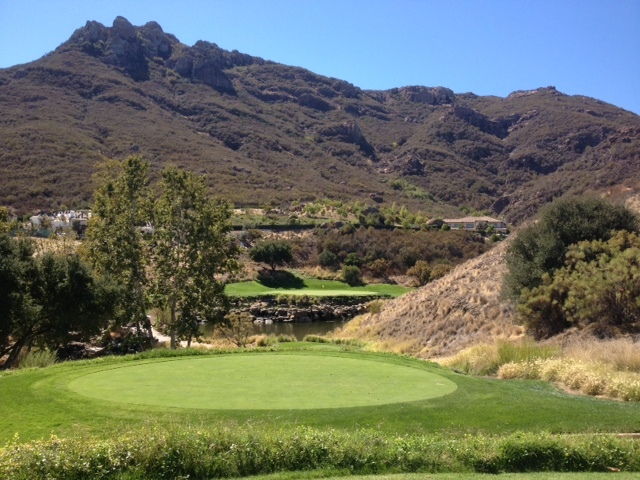 Played to the towering backdrop of the Santa Monica Mountains, the way the hole is framed is the complete flip of No. 3 at Torrey, but still entirely awesome. Several waterfalls feed a group of ponds in the front creating one intricate and fascinating water feature that made the hole an absolute rock star on TV. I hope I haven’t played this hole for the last time, but if I have, I’ll never forget it. During a fairly fantastic two-week stretch of golf, I played Sherwood and Wilshire on consecutive Mondays. Played any time, they would be great, but it was even better the way it worked out because it allowed me to really appreciate the contrast. Whereas Sherwood is new school golf, Wilshire, established in 1919, is decidedly old school. It’s a shorter course that defends itself very aggressively with an army of rugged bunkers placed anyway and everywhere, many in plain sight, but with some hidden in dastardly places. I half expected to find one lurking in the parking lot after I got done. So, yes, the bunkers get in your head a little. I had a full-on case of bunker fatigue by the time I arrived at No. 7 near the end of my round (again, scramble format). 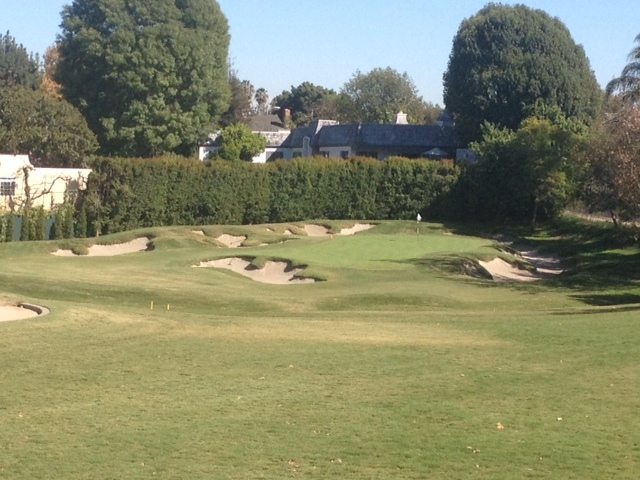 The par-3s at Wilshire are all unique – especially the one with the insanely big two-tiered green – but I picked No. 7, again, because it was the most memorable. Playing a shade over 140 yards, No. 7 is the shortest of the bunch, but it might be the toughest to birdie. Even with a solid tee shot, the green proved nearly impossible to one-putt. But to back up a bit to the tee shot, I recall hitting a solid pitching wedge and then absolutely holding my breath during the ball flight, which seemed to last forever. I could tell the caddie and I where thinking the same thing: back bunker. Instead, my ball hit the back fringe and stuck like it had hit flypaper. Whew!! That left me a downhill 8-foot slider that was the working definition of touchy. I barely tapped the ball and it never even thought about stopping at the hole. It’s one of those sneaky little putts where if you hit it five times, you might make one. Might. My three-putt bogey was a bummer, but at least I was spared waging war with the bunkers, unlike my playing partners. Wilshire is a great course, but it never lets you rest. It made me work for every par that day and only surrendered one birdie despite a bunch of great looks, like on No. 7. But at least I got to see the Hollywood sign from the course, which certainly ranks as one of the year’s best moments. Hopefully I get to do that again next year. My par-3 series will conclude with part III, likely on Thursday. This entry was tagged Darron Stiles, Farmers Insurance Open, Golf, Hollywood, La Jolla, Sherwood County Club, Tiger Woods, Torrey Pines, Wilshire Country Club, World Challenge. Bookmark the permalink.